A major shipping route located between Oman and Iran where nearly one-third of the world's sea-traded oil passes through daily may become a new flashpoint after a top Iranian Navy general said Monday that the country has taken full control of the Strait of Hormuz. The head of the navy of Iran’s Revolutionary Guards, Gen. Alireza Tangsiri, said that Iran had full control of both the Persian Gulf itself and the Strait of Hormuz that leads into it, Reuters reported. 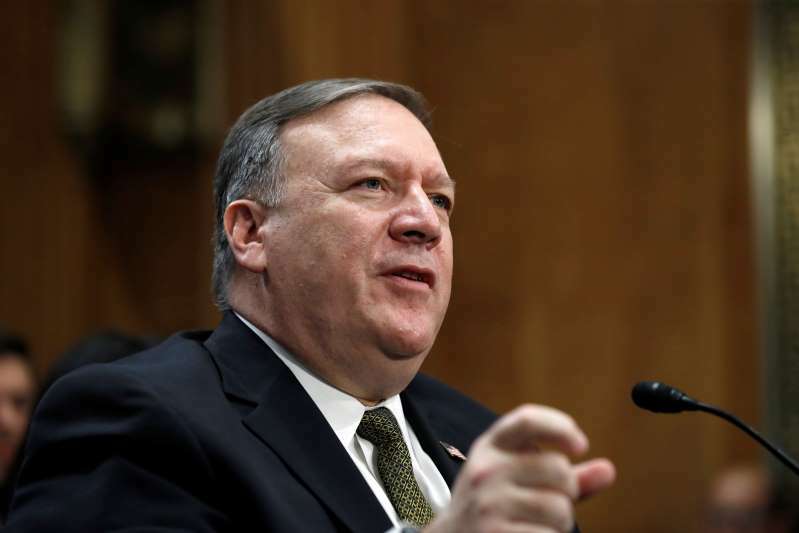 Secretary of State Mike Pompeo responded Monday night: "The Islamic Republic of Iran does not control the Strait of Hormuz. The Strait is an international waterway. The United States will continue to work with our partners to ensure freedom of navigation and free flow of commerce in international waterways." The strait, which at its narrowest point is 21 miles wide, has shipping lanes that are 2 miles wide in each direction and is the only sea passage from many of the world's largest oil producers to the Indian Ocean. "It's a very contentious area," retired Lt. Col. Bob Maginnis told Fox News' "Your World with Neil Cavuto" earlier this month. The Strait of Hormuz is where most of the oil from Saudi Arabia passes through, according to the U.S. Energy Information Administration. The Saudis have constructed pipelines to bypass the strait, but a majority of crude oil is shipped by sea, meaning that any action by Iran to halt shipping may impact consumers across the world. "The blockage of the Strait of Hormuz, even temporarily, could lead to substantial increases in total energy costs," the agency said in a 2012 report. At the beginning of August, Iran began a large-scale exercise in the Strait of Hormuz involving more than 50 small boats, practicing “swarming” operations that could potentially shut down the vital waterway if ever deployed for real. The drill came after President Trump pulled the U.S. out of a landmark nuclear accord with Iran and leaders of both countries exchanged fiery rhetoric. The country routinely operates small boats in the Strait of Hormuz and the surrounding area, and has often threatened to shut down the highly traveled waterway. A check of conditions on MaritimeTraffic.com on Monday showed that conditions appeared to be normal, with heavy maritime traffic through the strait. In recent weeks Iranian President Hassan Rouhani renewed the threat, saying that if sanctions threatened Iran's crude oil exports, the rest of the Middle East's exports would be threatened as well. "They're causing problems once again, as predicted, in the Strait of Hormuz," Maginnis said. "This is something we've grown accustomed too." But if Iran were to follow through with any bluster to close down the vital shipping channel, a potential U.S. response would be swift. "The U.S. and our partners provide and promote security and stability in the region on a daily basis," Lt. Chloe Morgan, U.S. Naval Forces Central Command spokesperson, said in a statement to Fox News on Monday. "Together, we stand ready to ensure the freedom of navigation and the free flow of commerce wherever international law allows." Gen. Joseph Votel, head of U.S. Central Command, said earlier this month that Iran was showcasing its military capabilities and has the ability to plant mines and explosive boats in the waterway, as well as use missiles and radar along the coast. He stressed the U.S. and allies routinely train for that possibility and are prepared to insure that freedom of navigation and commerce continues in those waters. "We are aware of what's going on and we remain ready to protect ourselves," he told reporters. Fox News security analyst Walid Phares told Fox Business Network's "Varney & Co." that the Iranians can damage the international passage "if they want," but that the U.S. can easily "intercept them, stop them, and damage their own capacity." "It's kind of a brinkmanship capacity of gaming with us," Phares said. "I think the United States is very much attentive to what they are doing, and will respond if the Iranians will cross that red line." President Obama's former National Security Adviser Jim Jones, a four-star general, said in an interview earlier this month the Iranian Navy should be "wiped out" if any action is taken to block maritime traffic. “I personally would like to see, if they ever did something in the Strait of Hormuz, I would like to see their navy disappear," Jones told The National. Jones, who served as national security adviser for Obama from 2009 to 2010, also told the National that Iran's government is an "an existential threat to the region." Iran has been active in Syria, backing the government of President Bashar Assad, while also stoking violence in the southern part of the country and triggering military counterattacks from Israel. The U.S. and Saudi Arabia have condemned Iran repeatedly for providing missiles to Yemeni Houthi rebels, who have fired toward Riyadh. The Iranian officials recently threatened to block the waterway in retaliation for any hostile action by the U.S. government amid President Trump’s remarks in July, which were prompted by the Iranian President Rouhani saying the U.S. risks the “mother of all wars" with Iran. Just over two weeks ago, Iran test-fired a ballistic missile as a brazen display of defiance, which coincided with the naval exercise, three U.S. officials with knowledge of the launch told Fox News at the time. While the U.S. military publicly acknowledged the naval activity, the missile test from an Iranian Revolutionary Guard Corps base in Bandar-e-Jask in southeastern Iran has not been previously reported. The launch was detected by U.S. spy satellites.